Government has commended the United Church of Zambia for contributing to national development by promoting various activities including constriction of schools and hospitals. Central Province Deputy Permanent Secretary Ronald Sinyangwe said this in Kabwe during the Lunch of the UCZ Golden Jubilee celebrations on Sunday, March 2, 2014 at St Peter’s Congregation, Kabwe South Consistory. 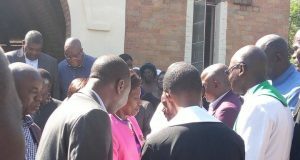 Mr. Sinyangwe, who was Guest of Honour, also praised the UCZ for “being a model Church that emphasizes the unity of various Christian denominations”. “I commend the Church for your contribution to national development through various activities including the construction of schools and hospitals. 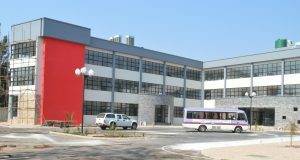 To contribute to the growth of education in the country, the UCZ has opened the UCZ University College in Kitwe, which will also provide academic consultancy services apart from offering theological and business degree courses,” said Mr. Sinyangwe. And Central Presbytery Bishop, Rev. 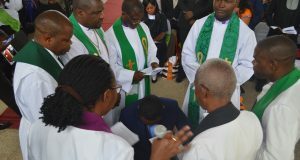 Edward Musonda, appealed to the congregants to use the celebrations as a “time of reflection (in) appreciating the grace of God in keeping the UCZ truly united and also to count the blessings resulting into the growth of the Church both numerically and spiritually”. The celebrations were well-organised and all eight Consistories participated. These are Chitambo, Kapiri, Mkushi, Kabwe North, Kabwe South, Chipembi, Keembe and Serenje. More than 3,000 people attended the Golden Jubilee Launch. The UCZ will turn 50 years on January 16, 2015. The sermon was preached by Rev. Damson Kunda under the theme: “Declaring the year of the Lord’s favour” (Exodus 3:7-15, Luke 4: 16-19 and Galatians 3: 13-14). Rev. Kunda highlighted the importance of remembering the covenant God made with the Israelites, and the background history of moving from Egypt, passing through the Red Sea up to the Promised Land, Canaan. He encouraged the congregants to be “counted as a people of the covenant”. “We need to continue to work together and remain as one, being members of one Church that celebrates Jesus as our Jubilee on a daily basis,” said Rev. Kunda. During the Launch, a number of Church members were dressed up in Golden Jubilee chitenge attire. The Synod team to Central Presbytery consisted of Mrs. I. Ntambo, Mrs. E. Kapuka and Mr. Chate.